Your county organization is the gateway to getting involved. We drive the front-line efforts of the Washington State Democratic Party: registering and educating voters, protecting the right to vote, and working to elect candidates who will fight for our values. From local elections to Congressional races, we are working hard to help Democrats win and engage more voters. 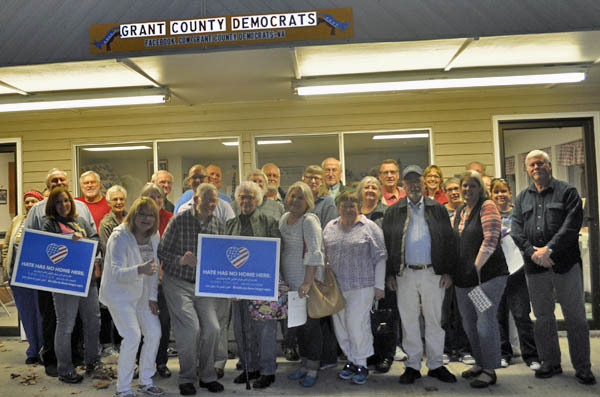 The Grant County Democrats meet on the third Tuesday of each month at the Democrat booth on the Grant County Fairgrounds. The meeting starts at 6:30. We would love to see you there. If you would like to make a positive difference in our community, our state, and our country please give us your email along with a message describing your interest. We look forward to working together to make the world a better place.